Pupils from Kent's Wilmington Grammar School for Girls this week visited London South Bank University (LSBU) to get a taste what of a career in Food Technology is like, coinciding with National Careers Week (3 – 7 March). Twenty year 11 students from Kent travelled to LSBU, where the University's Food Scientist Dr Ken Spears showed the pupils a creepy crawly example of new food product development (NPD) – edible insect snacks created with a 3D printer from ground-up insects. LSBU's edible insects project tied in perfectly with the students curriculum, with innovation in food technology being a key requirement of the current GCSE food technology syllabus, which the students are gearing up to take. The pupils were provided with commercial smoothie products and carried out product evaluations to measure, pH, soluble solids, sensory profiles, nutritional analysis and used the information to recommend a 'best buy'. 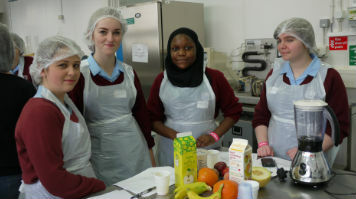 Then - suitably dressed as food handlers – the pupils were provided with a variety of fresh fruits and other ingredients, such as honey and yoghurt and briefed to design a new smoothie product with similar quality features to the commercial products. Claire Johnston teacher at Wilmington Grammar School for Girls, said: "With technology changing at an ever increasing rate, it is important that students explore topics that are current and relevant to them. "The activities and learning at the event were an excellent way for the students to engage in a part of the curriculum that continues to change and impact our lives - a fantastic opportunity for the students to learn and in an interactive and exciting way!" Speaking about the importance of introducing pupils to the practical elements of food technology, Dr Ken Spears said: "The food industry offers a wide range of careers in food technology, particularly in new food product development, and these type of events give young students a 'taste' of higher education and career opportunities."